Simplexx is our line of easy to build cabinets. All Simplexx cabs feature braced half-inch plywood construction, for better performance with lighter weight than commercial cabs. All feature corner located ports, for stronger construction with less weight than round or slot ports. Corner ports also sound better than round or slot ports, as their placement equalizes air pressure inside the cabinet, preventing cone rock at high levels. Two driver bass and keyboard cabs feature vertically stacked woofers and dual vertically stacked tweeters, for maximum horizontal dispersion with no high frequency beaming or comb filtering. S10 and S12 PA tops feature Eminence coaxial drivers. These cabs aren’t difficult to build, but they still feature engineering that even ‘boutique’ cabs can’t lay claim to. Simplexx 10 plans include 1x10 and 2x10 sealed and ported electric bass versions, with or without tweeters, 1x10 and 2x10 keyboard versions, and a 1x10 PA top version. 1x10 Dimensions: 18” wide, 16.5” high, 14” deep. 17 pages, 42 pictures and diagrams. Equivalent retail value, 1x10 w/tweeter: $449 with base drivers. Simplexx 12 plans include 1x12 and 2x12 sealed and ported electric bass versions, with or without tweeters, 1x12 and 2x12 keyboard versions, and a 1x12 PA top version. 1x12 Dimensions: 20” wide, 17” high, 15” deep. 18 pages, 44 pictures and diagrams. Equivalent retail value, 1x12 w/tweeter: $499 with base drivers. 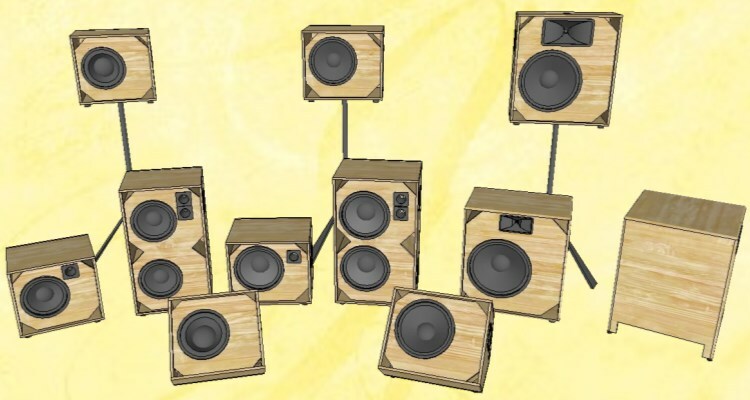 Simplexx 15 plans include 1x15 sealed and ported electric bass versions, with or without tweeters, 1x15 keyboard version, a 1x15 PA top and 1x15 PA subwoofer versions. Dimensions: 24” wide, 26.5” high, 14” deep. 15 pages, 31 pictures and diagrams. Equivalent retail value, 1x15 w/tweeter: $599 with base drivers. Simplexx 15 Sub plans include down-firing sealed and ported home theater versions, and a pro-sound PA version, all using 15 inch drivers. Dimensions: 20” wide, 24.5” high, 20” deep. 17 pages, 38 pictures and diagrams. Equivalent retail value: $849 with base driver. Simplexx 18 subwoofer plans include down a firing sealed home theater version and a ported pro-sound version for 18 inch drivers. Dimensions 22” wide, 27.5” high, 22” deep. 24 pages, 60 pictures and diagrams. Equivalent retail value: $899 and up, depending on the driver used. Simplexx Wedge plans contain both ten inch and twelve inch floor monitor plans. Loaded with a coaxial woofer/tweeter, they insure maximum intelligibility at the short listening distances of stage monitoring. These monitors also may be pole mounted for use as PA tops. Ten loaded dimensions are 18" high, 16.5" high, 14" deep. Twelve loaded dimensions are 20" wide, 17" high, 15" deep. 16 pages, 41 pictures and diagrams. Equivalent retail value: Ten inch $449, twelve inch $499. Simplexx Tilt Back plans include 1x12 electric bass and keyboard versions, with or without tweeter. This cab may be used upright or tilted back at a 45 degree angle, for those very small stages where you can’t stand far enough away from your cab to hear the mids and highs. It may be built as a speaker only or as an ‘air head’, with room for a two-space rack mounted amp. 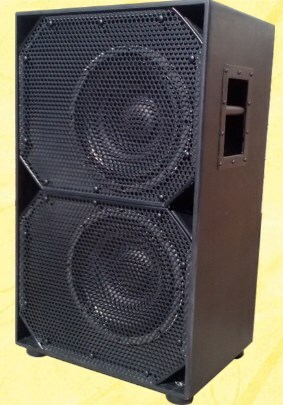 Dimensions: Speaker only version 20” wide, 17” high, 14.5” deep. Air Head version 20” wide, 21” high, 14.5” deep. 23 pages, 52 pictures and diagrams. Equivalent retail value, 1x12 w/tweeter: $499 with base drivers. All plans are absolutely complete, showing detailed pictures of every construction step. Included are lists of parts, recommended drivers, and T/S driver spec requirements for driver substitution. These are separate plans. Orders must specify which version you want, the 10, 12, 15, 15 Sub,18, Wedges or Tilt Back. Plans are $14.95 for one plan; see the How to Order Plans page for multiple plan volume discounts.